Somedays you just don’t want Fido in the car riding with you. He is going to bark and make a mess of the place. Well, apparently if you lived in the 1950s you used to be able to have Fido have his own little area alongside of you even while not being in the car. I don’t quite think it would work today, but I’m sure someone has tried. To more dog-gone innovation gone wrong! Dogs and their accessories are continuing to astound me. 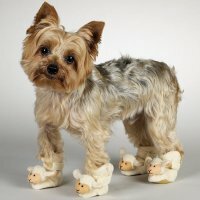 Jay Leno mentioned dog slippers tonight so I did a little digging and found a couple of great examples of how little Rover actually enjoys wearing these terrible creations. 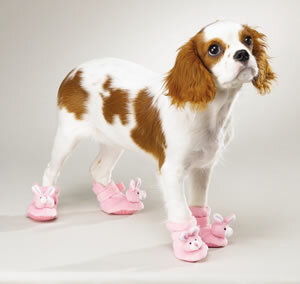 Frankly, you take all masculinity away from a male dog if you place nice, cute rabbit or bunny slippers on his paws. I don’t believe that you can take Rover hunting or swimming or anything after this because he is sure to be the laughing stock of the neighborhood. To dogs continuing to amuse!